History in the trauma setting may not be helpful and physical examination is generally nonspecific, but pancreatic injury should always be considered in patients with epigastric tenderness.9 Grey Turner’s sign and Cullen’s sign may be present, although these are not sensitive markers of pancreatic trauma.9 Absence of such clinical findings does not exclude pancreatic injury in a patient with a typical mechanism of injury because pancreatic injury often evolves over time with activation of pancreatic enzymes and initiation of the inflammatory response. Early complications arise primarily from concurrent injuries to other organs, predominantly vascular causing hemorrhage. Late complications or morbidity is increased in patients with delayed diagnoses of pancreatic injury, especially those with a missed ductal injury. Damage to the main pancreatic duct occurs in 15% of cases and is crucial to ascertain before or during laparotomy, as it necessitates pancreatic reconstruction by an experienced hepatobiliary surgeon.9 In patients with pancreatic trauma who have survived the initial 48–72 hours, leakage of corrosive pancreatic juice from an undiagnosed injured duct causes peripancreatic inflammation and may result in sepsis, which is the major cause of morbidity and mortality. For trauma patients already in the operating room for concomitant injuries, or those not eligible for MRCP or when ERCP is not available, intraoperative US may be performed to assist with immediate diagnosis of ductal injury.26 However, there are no large-scale studies that compare the sensitivity and specificity of US for pancreatic ductal injuries to those of ERCP, MRCP or cholecystocholangiopancreatography. With the availability of 64-slice and higher CT scanners, the entire scan can be acquired in the arterial phase. This facilitates optimal detection of vascular injury.27 Wong et al (2008) concluded that the portal venous phase CT was the most accurate scan in detecting pancreatic duct injuries (Table 3).28 Thin sections are routinely acquired for better visualization of the main pancreatic duct (Table 4), which normally measures 3mm to 4mm.27 3D post-processing techniques, such as curved planar reformats, appear to improve detection and characterization of pancreatic lacerations.27,29 However, further investigation is needed to confirm the utility of these techniques in the trauma setting. 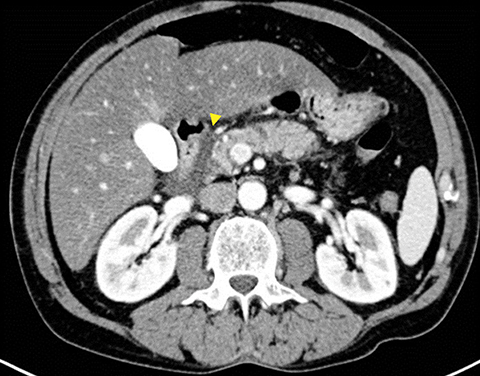 The injured pancreas may appear normal on CT images, particularly in the first 12 hours after trauma.9,17 Sensitivity of CT may improve with time after injury, as tissue damage from activated pancreatic secretions and peripancreatic inflammation evolves over time. 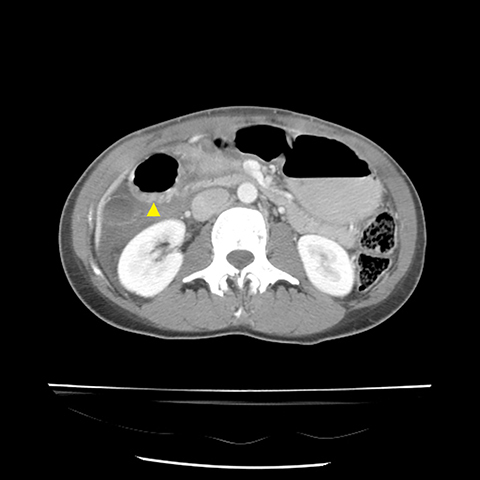 Therefore, a repeat CT in 24-48 hours may be warranted for patients with persistent symptoms.17,18 Published data demonstrates poor sensitivity for pancreatic injury and pancreatic ductal injury even with advanced CT technology.30 Thus, correlating the mechanism of injury and recognizing the subtle signs on CT are crucial to early and accurate diagnosis of pancreatic trauma. 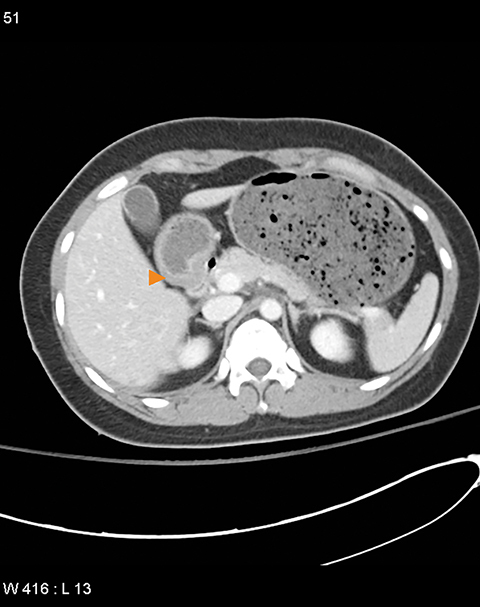 The CT findings of pancreatic trauma can be categorized into direct (specific) and indirect (nonspecific) features. Grade I and II injuries indicate contusion and/or superficial laceration without ductal injury (Figures 3 and 4). Grade III indicates deep laceration or transection with duct injury to the left of SMV (Figure 5). Grade IV injury indicates deep laceration or transection with duct injury to the right of SMV (Figure 6). Grade V injury is the most severe; it indicates pancreatic head disruption and is frequently associated with concomitant duodenal injury (Figure 7). 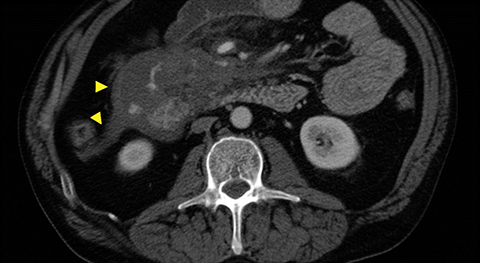 The indirect findings on CT that may indicate pancreatic injury include: 1) peripancreatic fluid in the lesser sac; 2) thickening of the left anterior renal fascia; and 3) fluid interdigitating between the pancreas and the spleen. 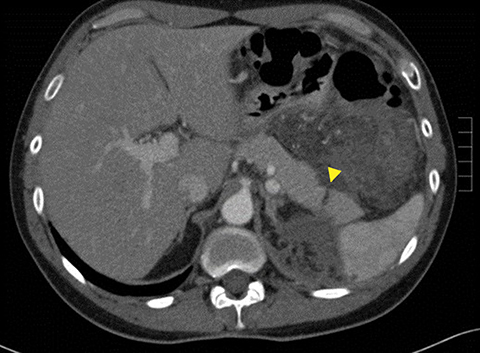 The indirect CT finding of peripancreatic fluid is highly sensitive (67-85%) but nonspecific, as it can be seen in trauma to other organs.31 However, the presence of indirect findings necessitates close examination of the pancreas and surrounding organs. CT is used to grade duodenal injury (Table 5). Duodenal injuries can be divided into minor and major categories. 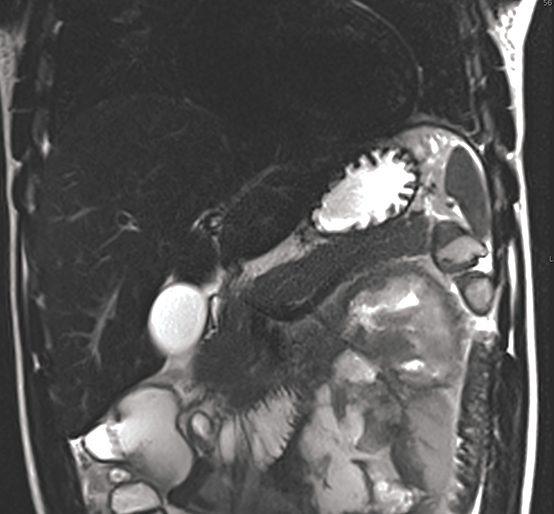 Minor injuries include duodenal hematoma and partial thickness lacerations, whereas major injuries include transmural lacerations/perforations and massive disruption of the duodeno-biliary-pancreatic complex.2,5 Findings suggestive of duodenal injury include: 1) wall thickening of > 4mm; 2) lack of wall continuity; 3) peri-duodenal fluid; 4) fluid in the right anterior pararenal space; 5) diminished bowel-wall enhancement; 6) extraluminal air or contrast (Figures 8, 9). The key findings to remember include lack of wall continuity and extraluminal air or contrast, which indicate duodenal perforation (Figure 8B). A few causes of false-positive findings in blunt duodenl injury imaging include: 1) duodenal diverticulum simulating retroperitoneal air, 2) retroperitoneal hematoma from a nonduodenal source, and 3) unopacified bowel loops adjacent to the duodenum which may obscure subtle findings. Pancreaticoduodenal injury in blunt abdominal trauma is uncommon, but when present is associated with high mortality. Mortality and morbidity significantly increase when this injury is not recognized at admission. Therefore, an early diagnosis is critical in delivering appropriate and timely interventions. CT is the imaging modality of choice in stable patients. Radiologists must be aware, however, of the imaging pitfalls that may confound CT findings. 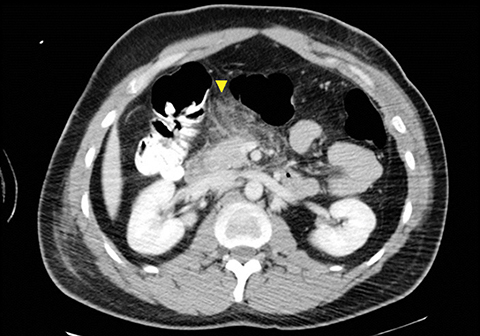 Moreover, pancreatic duct injury is poorly characterized on CT and remains a significant challenge in the management of pancreatic trauma. Lately, MRCP in combination with the intravenous administration of secretin has been successfully employed to improve characterization of pancreatic ductal anatomy. A modified CT grading system of pancreatic injuries by Wong et al (2008) allows for determination of surgical versus nonoperative treatment. 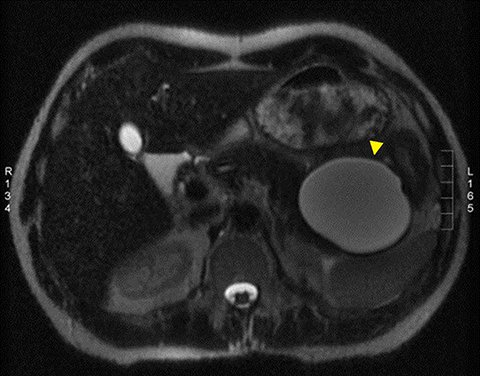 Nonoperative management of pancreaticoduodenal injuries has become the preferred treatment for hemodynamically stable patients due to increased accuracy of MDCT in excluding other surgically important vascular and solid organ injuries. Cirillo RL Jr, Koniaris LG. Detecting blunt pancreatic injuries. J Gastrointest Surg. 2002;6(4):587-598. Daly KP, Ho CP, Persson DL,et al. 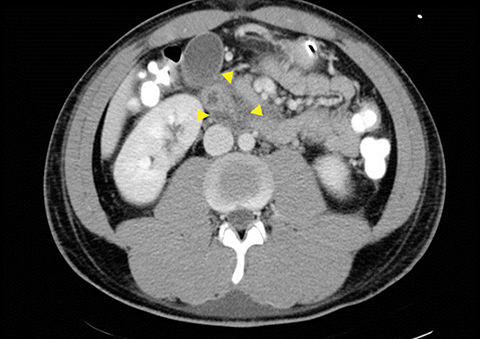 Traumatic retroperitoneal injuries: review of multidetector CT findings. Radiographics. 2008;28(6):1571-1590. Linsenmaier U, Wirth S, Reiser M, et al. Diagnosis and classification of pancreatic and duodenal injuries in emergency radiology. Radiographics. 2008;28(6):1591-1602. Rekhi S, Anderson SW, Rhea JT, et al. Imaging of blunt pancreatic trauma. Emerg Radiol. 2010; 17(1):13-19. 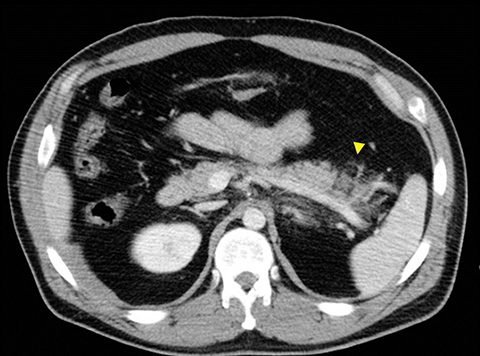 Soto JA, Anderson SW. Multidetector CT of blunt abdominal trauma. Radiology. 2012;265(3): 678-693. Stawicki SP, Schwab CW. Pancreatic trauma: demographics, diagnosis, and management. Am Surg. 2008; 74(12);1133-1345. Wolf A, Bernhardt J, Patrzyk M, et al. The value of endoscopic diagnosis and the treatment of pancreas injuries following blunt abdominal trauma. Surg Endosc. 2005;19(5):665-669. Peitzman AB, Makaroun MS, Slasky BS, et al. 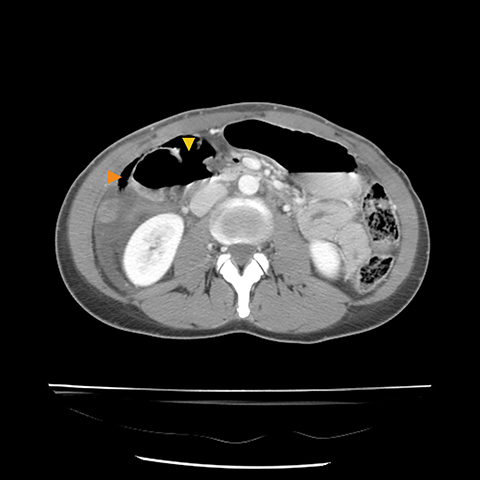 Prospective study of computed tomography in initial management of blunt abdominal trauma. J Trauma. 1986;26(7):585-592. Lahiri R, Bhattacharya S. Pancreatic trauma. Ann R Coll Surg Engl. 2013;95(4):241-245. Iqbal CW, St. Peter SD, Tsao K, et al. Operative vs nonoperative management for blunt pancreatic transection in children: multi-institutional outcomes. J Am Coll Surg. 2014;218(2):157-162. Jones C. Management of pancreatic trauma. Am J Surg. 1985;150(6):698-704. Patton JH Jr, Lyden SP, Croce MA, et al. Pancreatic trauma: a simplified management guideline. J Trauma. 1997; 43(2):234-239; discussion 239-241. Feliciano DV, Martin TD, Cruse PA, et al. Management of combined pancreatoduodenal injuries. Ann Surg. 1987; 205(6):673-680. Vasquez JC, Coimbra R, Hoyt DB, et al. Management of penetrating pancreatic trauma: an 11-year experience of a level-1 trauma center. Injury. 2001;32(10):753-759. Wales PW, Shuckett B, Kim PC. Long-term outcome after nonoperative management of complete traumatic pancreatic transection in children. J Pediatr Surg. 2001;36(5):823-827. Lin BC, Chen RJ, Chang JF, et al. Management of blunt major pancreatic injury. J Trauma. 2004; 56(4):774-778. Wong YC, Wang LJ, Lin BC, et al. CT grading of blunt pancreatic injuries: prediction of ductal disruption and surgical correlation. J Comput Assist Tomogr. 1997;21(2):246-250. Gupta A, Stuhlfaut JW, Fleming KW, et al. 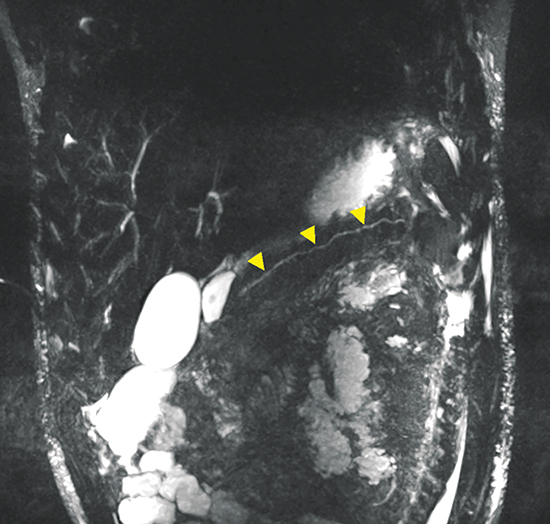 Blunt trauma of the pancreas and biliary tract: a multimodality imaging approach to diagnosis. Radiographics. 2004;24(5):1381-1395. Mahajan A, Kadavigere R, Sripathi S, et al. Utility of serum pancreatic enzyme levels in diagnosing blunt trauma to the pancreas: a prospective study with systematic review. Injury. 2014;45(9):1384-1393. Panda A, Kumar A, Gamanagatti S, et al. Evaluation of diagnostic utility of multidetector computed tomography and magnetic resonance imaging in blunt pancreatic trauma: a prospective study. Acta Radiol. 2015; 56(4):387-396. Wright MJ, Stanski C. Blunt pancreatic trauma: a difficult injury. South Med J. 2000;93(4):383-385. Gillams AR, Kurzawinski T, Lees WR. Diagnosis of duct disruption and assessment of pancreatic leak with dynamic secretin-stimulated MR cholangiopancreatography. AJR Am J Roentgenol. 2006;186(2):499-506. Sanyal R, Stevens T, Novak E, et al. Secretin-enhanced MRCP: review of technique and application with proposal for quantification of exocrine function. AJR Am J Roentgenol. 2012;198(1):124-132. Griffin N, Charles-Edwards G, Grant LA. Magnetic resonance cholangiopancreatography: the ABC of MRCP. Insights Imaging. 2012;3(1):11-21. Ragozzino A, Manfredi R, Scaglione M, et al. The use of MRCP in the detection of pancreatic injuries after blunt trauma. Emerg Radiol. 2003;10(1):14-18. Hofmann LJ, Learn PA, Cannon JW. Intraoperative ultrasound to assess for pancreatic duct injuries. J Trauma Acute Care Surg. 2015; (4):888-891. Dreizin D, Bordegaray M, Tirada N, et al. Evaluating blunt pancreatic trauma at whole body CT: current practices and future directions. Emerg Radiol. 2013;20(6):517-527. Wong YC, Wang LJ, Fang JF, et al. 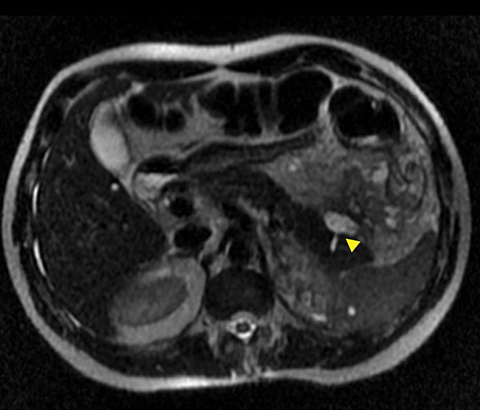 Multidetector-row computed tomography (CT) of blunt pancreatic injuries: can contrast-enhanced multiphasic CT detect pancreatic duct injuries? J Trauma. 2008;64(3):666-672. Gong JS, Xu JM. Role of curved planar reformations using multidetector spiral CT in diagnosis of pancreatic and peripancreatic diseases. World J Gastroenterol. 2004;10(13):1943-1947. Potoka DA, Gaines BA, Leppaniemi A, et al. Management of blunt pancreatic trauma: what’s new? Eur J Trauma Emerg Surg. 2015;41(3):239-250. Gordon RW, Anderson SW, Ozonoff A, et al. 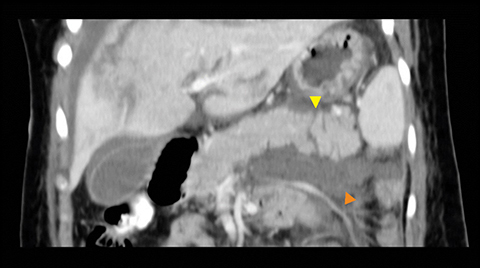 Blunt pancreatic trauma: evaluation with MDCT technology. Emerg Radiol. 2013;20(4):259-266. Smego DR, Richardson JD, Flint LM. Determinants of outcome in pancreatic trauma. J Trauma. 1985;25(8):771-776. Katz DS, Hines J, Math KR, et al. 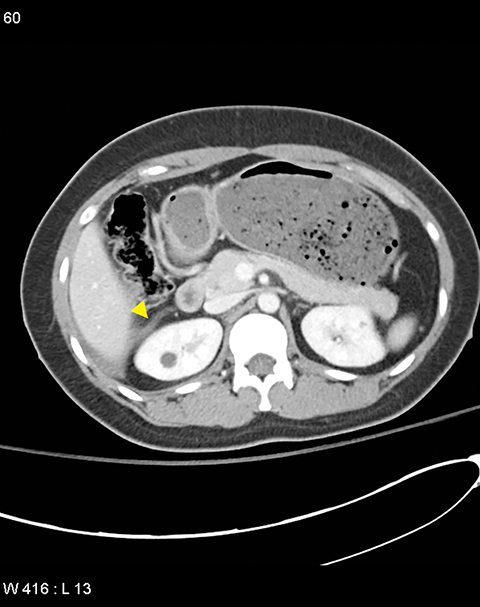 Using CT to reveal fat-containing abnormalities of the pancreas. AJR Am J Roentgenol. 1999;172(2):393-396. Wind P, Tiret E, Cunningham C, et al. Contribution of endoscopic retrograde pancreatography in management of complications following distal pancreatic trauma. Am Surg. 1999;65(8):777-783. Beres AL, Wales PW, Christison-Lagay ER, et al. Non-operative management of high-grade pancreatic trauma: is it worth the wait? J Pediatr Surg. 2013;48(5):1060-1064. Sharpe JP, Magnotti LJ, Weinberg JA, et al. Impact of a defined management algorithm on outcome after traumatic pancreatic injury. J Trauma Acute Care Surg. 2012;(1):100-105. Strobel O, Schneider L, Philipp S, et al. Emergency pancreatic surgery-demanding and dangerous. Langenbecks Arch Surg. 2015 online. Degiannis E, Boffard K. Duodenal injuries. Br J Surg. 2000;87(11):1473-1479. Shah S, Khosa F, Ra Si, McLaughlin P, Louis L, Nicolaou S. Imaging blunt pancreatic and duodenal trauma. Appl Radiol. 2016;45(11):22-28. Dr. Shah is a Radiology resident at the Geisinger Medical Center, Danville, PA; Dr. Khosa, Dr. Rai, Dr. McLaughlin, Dr. Louis, and Dr. Nicolaou are Radiologists at the University of British Columbia, Vancouver, B.C. Disclosure: Faisal Khosa is the American Roentgen Ray Society Scholar (2013-2016). Dr. Khosa also receives support from NIH Grant 1R56HL126558-01. There was no commercial funding for this study.